The price of Brent crude rallied on Monday to break above $85 per barrel, marking the seventh consecutive bullish day in the commodity. The rally was triggered on reports that OPEC added only a small amount of additional supply in September, with all OPEC countries producing 32.85 million barrels per day in the previous month – a modest increase of 90,000 bpd compared to August levels. Despite the decision of OPEC+ countries not to ramp up oil production, Saudi Arabia promised to add additional supply in September and October. However, the additional Saudi supply of only 50,000 bpd in September was more than offset by the 100,000 bpd loss from Iran. While Libya has also restored its oil output to above 1 mb/d, this is merely a restoration of previous supply outages and markets are still worried that the ongoing conflict in Libya could mean more disruption in the future. From a technical standpoint, Brent crude reached an important resistance level at the upper bound of a weekly channel, which could attract sellers at current levels of around $85 per barrel. The daily candle is already turning red – the first bearish sign in the last seven trading days – and the RSI reached its highest level since February 2012, suggesting prices are extremely overbought. A short-term price correction could send the price down to the September 12 high around the $80 mark, before Brent continues its well-defined uptrend to fresh marginal highs. As of 11:53 London time, Brent traded at $85.26. What's your view on Brent crude? Trade it with a REGULATED BROKER. Japanese households are becoming more optimistic about the economic outlook, income growth and employment, the official Consumer Confidence report for September showed. The indicator edged higher to 43.4 index points in September compared to 43.3 points in August, and beat market expectations of 43.0. 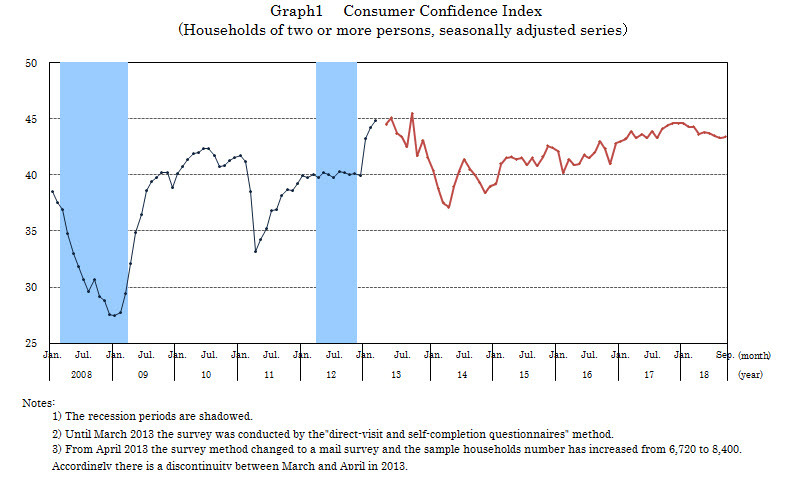 Japanese consumer confidence has ranged between 43 and 45 for the most of the year, although it seems that households had had a more positive outlook over the first quarter of 2018. Regarding individual categories, the willingness to buy durable goods increased the most among surveyed households and reached 42.4 index points in September, up 0.4 points from the previous month. The report also showed that the majority of Japanese households are expecting an increase in prices in the coming year, with the percentage increasing to 81.7% of surveyed households in September compared to 81.6% in the previous month. The Japanese yen traded mostly higher in this morning’s trade on a more evident risk-off sentiment across the markets. The Yen was rebounding against the US dollar after reaching an almost one-year low yesterday and traded at 113.72, as of 10:58 London time. As widely expected by the markets, the Reserve Bank of Australia left the official cash rate unchanged at 1.50% at today’s monetary policy meeting. RBA Governor Lowe’s statement following the meeting showed that the outlook for the Australian economy remained overall positive, despite a modest slow-down in the Chinese economy and uncertainties regarding United States’ international trade policy. The Board reaffirmed that the Australian economy is expanding strongly, with the GDP increasing by 3.4% over the past year. The Bank’s outlook on economic growth remained unchanged from previous meetings, with forecasts of an average growth “a bit above” 3% in 2018 and 2019. The statement also showed that the central bank remains optimistic about the labour market. Currently, the unemployment rate hovers around 5.3% which is the lowest level in almost six years. Over the next couple of years, the RBA expects that unemployment continues to decline to around 5% and that wages growth picks up more substantially amid the anticipated improvement in the economy. Regarding inflation, which currently is around 2%, the Bank expects that inflationary pressures build up in 2019 and 2020 and lift the inflation rate somewhat higher. What's your view on the Australian dollar? Trade it with a REGULATED BROKER. The British pound has continued to weaken against the U.S. Dollar during the European trading session, with weaker than expected UK data putting additional downside pressure onto sterling. The UK Construction PMI softened to 52.1 during the month of September, which was weaker than analysts expected. The report showed that business expectations fell to their weakest level since October 2017, as Brexit continued to be a drag on the UK economy. 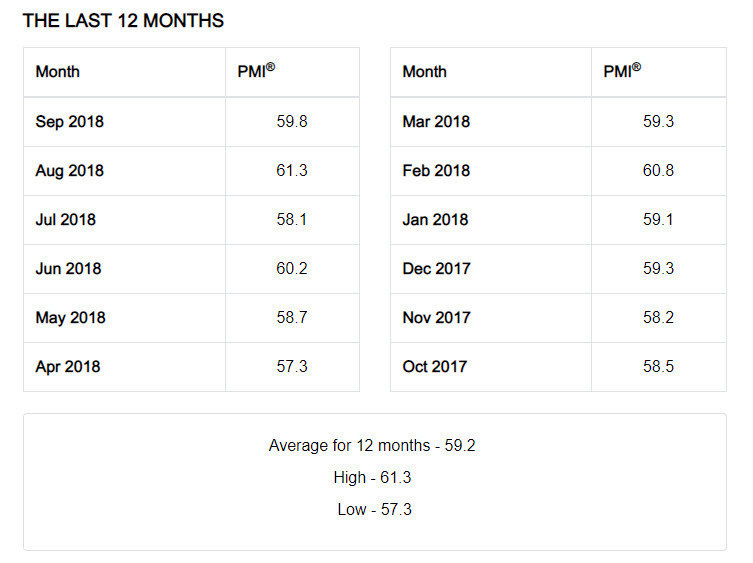 The only upbeat part of the PMI report showed that new orders were at their highest level since December 2016. Sterling is now trading below the 1.3000 handle and has fallen towards the 1.2970 region, as the U.S. Dollar continues to surge intraday and Brexit continues to be a drag on the British pounds sentiment. Key support below 1.2970 is found at the 1.2930 and 1.2900 levels, while key resistance is now 1.3030 and 1.3046. GBP/USD : The British pound continued to erode Monday’s strong gains against the greenback, as the U.S. Dollar Index moved to it’s highest trading level since September 9th. Sterling looked past reports that British PM Theresa May was prepared to make key concessions in order to break the deadlock with EU negotiators. 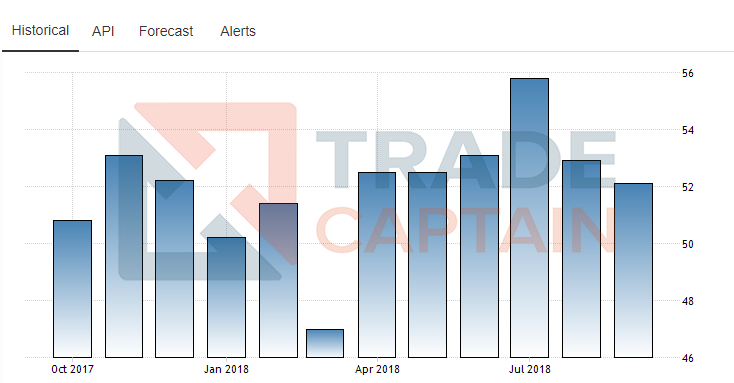 Traders also remained cautious ahead of the release of the UK construction PMI, with most economists expecting a 52.5 reading during the month of October. As of 06:55GMT the pair traded 0.17% lower, at 1.3017. USD/JPY : The U.S Dollar held close to the 114.00 level against the U.S. Dollar, as rising U.S. Treasury yields continued to support a strong bid-tone in the risk-sensitive pair. The USD/JPY pair hit an eleven-month trading high on Monday, of 114.06, as U.S. Dollar strength and improving investor risk sentiment continued to weigh on the Japanese currency. As of 07:00GMT the pair traded 0.05% lower, at 113.85. USD/CAD : The U.S. Dollar traded towards the 1.2800 level against the Canadian Dollar, as the loonie held towards a four-month trading high against the greenback. 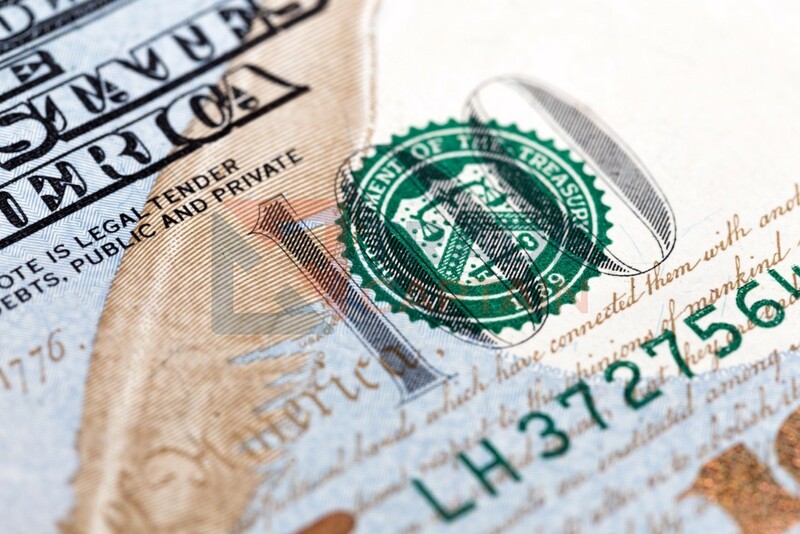 The USD/CAD pair fell to 1.2782 on Monday over the official announcement of the new tri-lateral NAFTA deal, oil price moved marginally lower on Tuesday, with Brent Crude easing from it’s highest trading level in nearly four years. As of 07:05GMT the pair traded 0.02% higher, at 1.2815. Factory growth in the United States slowed down in September, the latest Manufacturing PMI report of the Institute for Supply Management showed. The Index came in at 59.8 points in September, missing market expectations of 60.1 points and below last month’s reading of 61.3 points. According to the report, the New Orders, Production and Employment indices were growing in September, reaching 61.8, 63.9 and 58.8 index points, respectively. The New Orders index came in above 60 for the 17th consecutive month, indicating that demand remains strong in the U.S. manufacturing sector, while Customers’ Inventories remain low. While all three indices came in higher compared to the August report, the increase was more than offset by a decrease in the Supplier Deliveries, Inventories, and the Prices indices, which printed 61.1, 53.3 and 66.9 in September, respectively. It’s worth noting that the Prices Index continued to hover above the 50-threshold, indicating higher raw materials prices for the 31st month in a row. The report also showed that both imports and exports were growing in September, with a +0.6-point change and +0.8-point change compared to the August report, respectively. Despite the lower-than-expected PMI numbers, the US dollar spiked sharply higher against the Euro to dip below 1.16 for a short period. The single currency managed to rebound modestly to trade at 1.1601 against the greenback, as of 15:23 London time. What's your view on the EUR/USD pair? Trade it with a REGULATED BROKER. The United States has finally agreed on a trade deal with Canada on Sunday, after 13 months of negotiations which had hindered the economy of the United States’ northern neighbour. The new trade agreements, which is expected to result in freer markets, robust economic growth and new jobs in North America, won’t make any changes to the “Chapter 19” of the previous NAFTA agreement – a dispute-resolution system that Trudeau wanted to remain in the new deal. The agreement also shields Canada from car tariffs that the U.S. threatened to impose. A total of 2.6 million Canadian car exports to the U.S. will now be exempted from tariffs, significantly higher than the current 1.8 million. Besides the car industry, the new deal also includes changes in a range of other industries, from milk to pharmaceuticals. Today, U.S. President Trump congratulated Mexico and Canada and tweeted that the U.S. reached a “wonderful new Trade Deal” with Canada and Mexico, called The United States Mexico Canada Agreement (USMCA). The deal “solves the many deficiencies and mistakes in NAFTA”, Trump added. The Canadian dollar appreciated across the board in today’s trade, reaching a more than 4-month high against the US dollar. The Loonie rallied an impressive 0.60% against the Japanese yen, 0.36% against the Euro and 0.38% against the US dollar in the last 12 trading hours. The USD/CAD pair is now trading right on the support of a short-term downtrend channel, the break of which could see a retest of the lower bounds of a daily channel. What's your view on the Canadian dollar? Trade it with a REGULATED BROKER. The eurozone unemployment rate hit 8.1% during the month of August according to Eurostat, marking the lowest official unemployment rate seen across the eurozone since November 2008. Interestingly, Eurostat said that during the month of August the lowest rates were observed in the Czech Republic, at 2.5%, and Germany and Poland, both hitting 3.4% unemployment. 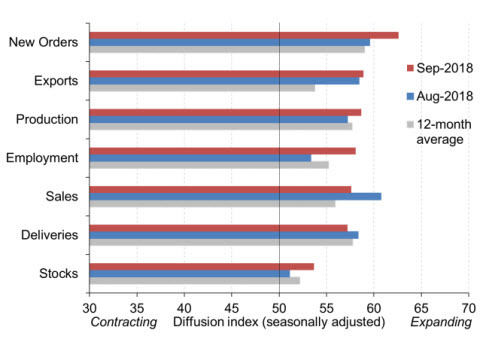 The highest unemployment rates were observed in Greece, at 19.1%, and Spain, at 15.2%. The euro has been moving away from the worst levels of the day, despite fears of the Italian budget plan and soggy German retail sales data this morning. Overall the final readings of most European nations came in as expected, although the eurozone September PMI manufacturing reading came in marginally weaker than expected. The Australian manufacturing sector continued to grow in September, according to the latest manufacturing survey from the Australian Industry Group. The AIG’s Manufacturing Index came in at 59.0 index points in September, signalling the second straight month of expansion after reaching 56.7 in August and 52.0 in July. 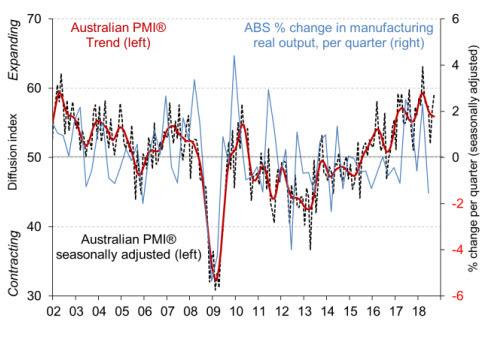 A reading above 50.0 signals expansion in the sector, with the Australian PMI being in expansion mode for a record two straight years on a month-on-month basis. In September, all seven sub-indices in the manufacturing index expanded on a seasonally-adjusted basis. The new-orders sub-index reached a six-month high, and only the deliveries and sales sub-indices slowed slightly down in September compared to the previous month. Exports also expanded at a faster pace in September, with the sub-index rising 0.5% to 58.9 index points. The employment sub-index increased by 4.8 points to reach 58.2 points, and the average wages sub-index increased by 4.6 points to a record-high of 69.3, signalling that wage pressure is building up in the Australian manufacturing sector. Following the release, the Australian dollar spiked initially higher against the US dollar but gave back all of the gains in this morning’s trade. As of 9:46 London time, the AUD/USD pair traded at 0.7213. What's your view on the AUD/USD pair? Trade it with a REGULATED BROKER. The British pound is trading at the best levels of the day against U.S. Dollar currency after the United Kingdom Manufacturing PMI beat market expectations with a 53.8 reading during the month of September, the previous months reading was also revised higher to 53.0 from 52.8. Today's PMI manufacturing number may be a improvement, but it still marks the second weakest reading of the year so far. Sterling had been under selling pressure this morning as the greenback firmed broadly over Italian budget concerns, although sellers once again failed to crack the 1.3000 support level. British Chancellor of the Exchequer Philip Hammond has been out on the wires this morning admitting that the UK economy has suffered from Brexit uncertainty, Mr Hammond also went as far to say that many business are delaying important decisions until the UK decides to leave the EU with or without a deal, effectively underscoring what the BoE has previously mentioned. Key support for the GBP/USD pair below the 1.3000 handle is found at the 1.2970 and 1.2930 levels, while key short-term resistance is found at the 1.3054 and 1.3096 levels. What's your view on the GBP/USD pair? Trade it with a REGULATED BROKER.